In-form St Helens came from behind to win 32-10 at Salford City Reds. Saints old boy Phil Veivers' side looked on for a shock when they led 10-0 on the half hour after tries from Vinnie Anderson and Danny Williams. But in-form Saints bounced back with tries either side of the break from Josh Jones and Lance Hohaia before Tommy Makinson edged them ahead. Three late tries from Jonny Lomax, Michael Shenton and Paul Wellens gave the scoreline a lop-sided look. Saints have now lost just two of their last 11 league games - both to leaders Wigan, who also put them out of the Challenge Cup - to climb to fourth in Super League XVII. The absence of Josh Perry was a blow for the visitors, although all nine of last week's international call-ups featured. And it was Salford who struck first, returning stand-off Daniel Holdsworth, a major influence in their 10-6 half-time lead, supplying the final pass that was finished off by former St Helens back rower Anderson. Holdsworth added the conversion and, after Hohaia had a try disallowed, Salford stretched their lead through Williams, celebrating a new two-year deal. 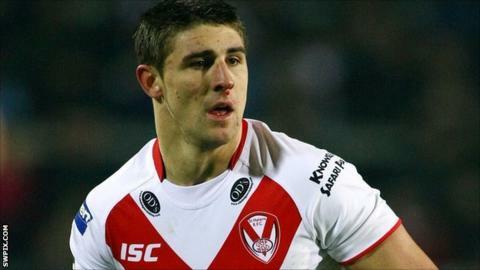 St Helens reduced the deficit when centre Jones collected Hohaia's high ball to touch down, Makinson adding the goal. It was third time lucky for Hohaia after two ruled-out scores when he went over from dummy half before Makinson went over at the corner shortly after. After losing Shannon McPherson to injury, Saints took advantage when Lomax touched down, before Shenton and Wellens added gloss with their late efforts. "It's tough enough to catch a ball in normal conditions with people running at you without the wind that was out there. "I'm disappointed for a lot of the guys in the dressing room. They didn't deserve the blowout in the scoreline. The game was a lot closer than the scoreline suggested. "We were in the game right to the end. We had one clock-off for Lance Hohaia's try, the rest were kick-tries and it's obviously something we have to work on." "You can't underestimate those conditions. They were horrendous. "But we're really pleased we got two points. There are a lot of positives we can take away. We spoke at half-time about knowing we could win. We just had to do the things that we do well. "We got into the grind and won that battle for territory and, when we got the chance to post some points, we took our chances." Salford: Patten; Broughton, Moon, Gleeson, Williams; Holdsworth, Smith; McPherson, Howarth, Sidlow, Ashurst, Anderson, Wild. Replacements: Gledhill, Paleaaesina, James, Nero. St Helens: Wellens; Makinson, Shenton, J Jones, Meli; Hohaia, Lomax; Puletua, Roby, Laffranchi, Flannery, Soliola, Wilkin. Replacements: McCarthy-Scarsbrook, Clough, Gaskell, Flanagan.